Roya Khadjavi Projects is pleased to announce its first exhibition of abstract works, featuring three young painters from Iran: Aida Izadpanah, Masoume Moghadam and Dana Nehdaran. States of Being in Abstract aims to explore the memories and emotions conveyed in painting, rather than focus on its literal execution. It is through this exploration that the artist’s state of being is revealed, be it autobiographical or a critique of the society in which they live. Masoume Moghaddam works with cardboard, an easily available material that satisfies the spontaneity with which she works. Unlike most abstract paintings, her works are small in scale and prompt her viewers to take a more intimate look into each painting’s delicate qualities. Influenced by the character of Majnoon in Nezami Ganjavi’s epic Persian poem, her works embody the turmoil of love. Like Majnoon, her thoughts are tangled and her being tortured. Vibrant colors take hold of every inch of the surface through agitated lines and swirling gestures. The layers of thick paint hint at a complex mood, an inner turmoil, and an almost unbearable state of being. Shapes resembling tornadoes, flames and graffiti further amplify this feeling of unease and loss of control. Through the metaphor of love, Masoume has allowed form to forego its representational function and run wild with emotion. By working in abstraction, Masoume is able to expand the limits of the apolitical and address the state of disarray that her generation faces. Unlike Masoume who is consumed by the present, Dana Nehdaran uses abstraction to highlight the ways in which past and present weave together in both conflict and harmony. Dana’s works are a balancing act, made evident by his belief that “the past provides the structural skeleton for the future”, and that change is inevitable and hope a reality. It is for this reason that he has chosen New York as his muse, a forever changing city for which he has tremendous admiration. The persistence of old iron rebar, beams, storm-water covers and other ironwork amidst New York streets enthrall Dana. 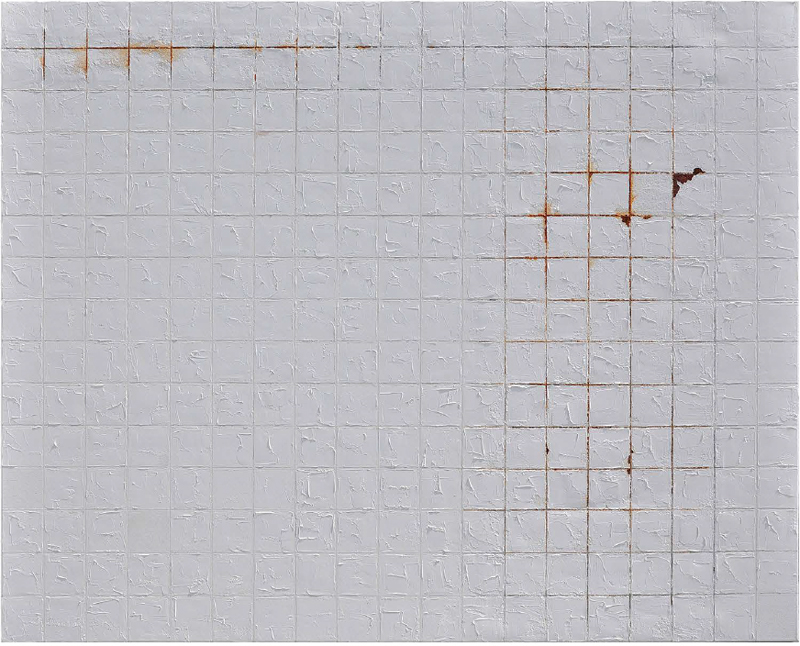 His works are tremendously laborious and are grounded in his desire to resurface the rusty patterns of the city. With a mélange of iron powder, paint and water, among other materials, he recreates the processes of rusting and decay that are all too familiar to New York. Never sure of the finished product, Dana waits patiently and adjusts his mediums until they reach a desired state. For artist Aida Izadpanah, abstraction is the purest form of artistic expression, as it “relies less or not at all on the mental processing of representation”. Through color, texture and space, she ignites movement and energy to create “a transcendence of the kinds of boundaries that divide the self and others, past and present and matter and energy”. Her works are “textured field paintings”, that by demoting the purely representational, prompt the viewer to engage and decode the many layers for themselves. Aida names her series after their completion. They are descriptions of what she experienced throughout the creative process. “In Revelation 4, we see many forces at work: dark and light, near-but-not-quite-complementary colors, an imbalanced compositional space with receding and emerging elements. These and other elements are factors in the experience of the work, but they are not the work itself, nor its experience. These choices are beyond right and wrong, but they are telling of our values. Transcendence 9 is precisely this kind of microcosmic reflection on the historical landscape, a sign of both something past and a present energy. Rust, erosion, and verdigris—the breaking down of boundaries, which would divide us if taken too literally, but which may be repurposed toward opposite aims.” Aida’s paintings follow the natural ebbs and flows of a life cycle, and dance the line between meditation and agitation. As Pollock once said: “Painting is self discovery. Every good artist paints what he is.” Through abstraction, these three artists have created a circumstance of self-meditation to cope with the uncertainty of being.